"To say that it is a pr community that welcomes all is also incorrect. It is an all community that welcomes all. We should not be fighting to keep "white people" out, we should be fighting to keep minorities in. Bringing awareness and business to the minority owned businesses and events being thrown in the park. If we say we are fighting to kick people out then we would be the same as them. Unity Unity Unity" says a Facebook commenter to an upcoming anti-gentrification event (look above). My response: No one is denying that there are other latinas/os and people of color living in Humboldt Park. 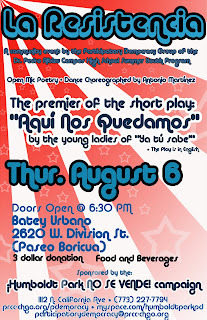 Nonetheless, this community is the cultural, economic, and political heart of the Puerto Rican people in Chicago. One way to combat gentrification is to stake a claim to an area - one that is rooted in the historical memory of its longtime residents. Therefore, with the strategy of Paseo Boricua (Division St.) this community is able to claim space in a myriad of way, whether it is with those two large flags or the murals on the walls. This a community that welcomes all, but also recognizes its historical and contemporary identity. I have met time and time again non-Puerto Rican residents of Humboldt Park who enjoy and participate what this community has done despite its Puerto Rican focus. This is also why we stand in solidarity with other communities of color facing gentrification, such as Pilsen and Bronzeville, the cultural hearts of the Mexican and Black communities, respectively. Unity is also important that is why Elvira Arellano and Flor Crisóstomo - two undocumented Mexican mothers - stood in sanctuary in Adalberto Methodist Church right here on Paseo Boricua with the full support and protection of the Puerto Rican Cultural Center across the street. We accepted them wholeheartedly because we stand in SOLIDARITY with our Latina/o fellow sisters and brothers. They did not stay in 26th Street or in Pilsen but right here, in what they understood (and everyone in this city) understands to be the heart of the Puerto Rican community. Elvira said many times that she was proud to be on Paseo Boricua and thanked all the support she received from the Puerto Rican community. There is a difference between solidarity and respecting spaces than a multicultural farce where "we are all one." A huge difference. 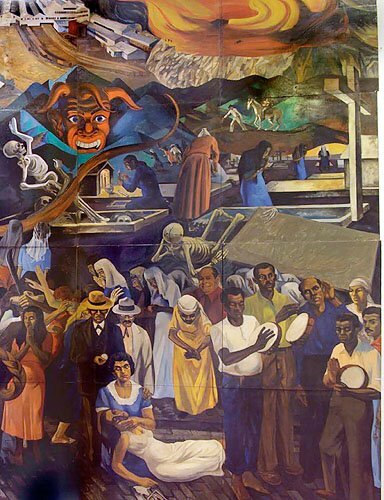 There are blacks and Mexicans and other groups in Humboldt Park just as there are Puerto Ricans in Little Village and Cicero, but that is not the same as building entire monuments, institutions, festivities, social and political networks...etc in those particular places that represent a particular group. That is why there is not a Puerto Rican-focused effort to rally around gentrification in Logan Square (where there are plenty of Boricuas). It is in Humboldt Park because it is our historic center and fighting gentrification is just more than saying we need housing for all, but that there are things here worth defending. “But also he fails to see that the people within the community are doing it to themselves. Putting the flags up was the action of ghettoization to themselves. My point is my friends is that before publishing a article there needs to be two things to happen here. One please proof read your articles. And second please have a point or take English 101," says a reader (I will call him “angry joe”) of my May 2009 Fíjate article. 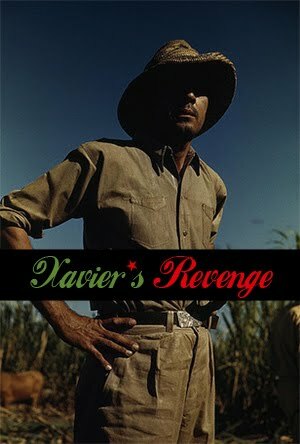 “¡Ay míjo, qué revolú!” my grandmother would say if she only know what new drama her grandson got himself into. Well, as you all know, soy sin pelo en la lengua, papá. For new readers, let me explain what I mean by all this and why “angry joe” is so hysterical. Well, in my last column I highlighted the urgent threat that the Puerto Rican community is facing with its displacement from Humboldt Park, represented in the form of a divisive e-mail by a new yuppie resident. In this e-mail, the resident was trying to persuade a community business owner from mingling with the ¡Humboldt Park NO SE VENDE! campaign, which is a grassroots organization seeking to preserve Paseo Boricua. As Boricuas in Chicago, we have seen this time and time again: when our communities are “redeveloped” and “repackaged” we are then treated as unwelcome pests. Like the story of a conguero friend of mine who raised his children in Bucktown only to have his oldest son one day be harassed in front of their home because a yuppie could not believe that a Puerto Rican family could live on “his” block, the arrogance of such an e-mail is evident to anyone who can feel human emotions. So, of course, I published a piece of it with a response. ¿Ay bendito, porqué tú hiciste eso,?” my grandmother would say. Well, for long as we have a Puerto Rican community, we must seek to provide an open and democratic forum from which we must discuss pressing and relevant issues. The preservation of Paseo Boricua and its discontents is the issue. But anyway, what a backlash I got from that! From close friends and associates jokingly saying “don't e-mail Xavi anything, he'll publish it in Fíjate!” to less funny and cute phone calls, e-mails, and even visits to the Puerto Rican Cultural Center, some people, one way or another, was bothered/amused by my column. All joking aside, I write all this not for ego, but to again highlight the issue: if we do not talk and do something about the displacement of the Puerto Rican community in Humboldt Park, then the forum to discuss, engage, envision, and build will no longer exist. As for “angry Joe's” e-mail, it does pinpoint an important and dangerous trend in thought by many new yuppie residents (not all are “angry new residents” - some are actually decent people who respect and understand the efforts of longtime residents to build this community and therefore seek to participate in it, not sabotage or bogart it): that Puerto Ricans have no right to claim this area as ours. Well, if one looks up the origins of ghettos, then one will see that they were areas in European cities where Jews were forced to live because they were beyond the “Kingdom of Christ.” This forced segregation did not deter this group to produce communities full of culture, history, and commerce. Humboldt Park was left to us Boricuas as a poor, worn-out slum by its Eastern European residents who left to the suburbs. Although, it is not perfect, walk down Division Street today and compare it to the street that my mother walked on decades ago, there is a huge, positive difference (businesses, festivals, buildings that look like Viejo San Juan...etc) and with its Puerto Rican identity intact (beginning with those two, 59-feet Puerto Rican Flags). But with “angry Joes” walking around, how long will it last? Change The Flag or Change The Status? Ay, Puerto Rico! Is it just El Nuevo Dia's reporting or do legislators in Puerto Rico like to use their positions to impose ambiguous and quite frankly, silly laws and regulations on their constituents (and the entire island)? Today in an article in the island's most widely circulated newspaper titled "Representante defiende proyecto para cambiar color a la bandera", reports that a Representative from Ponce is trying to officially change the colors of the Puerto Rican flag (gasps!). The legislator, Luis “Tato” León Rodríguez, (with a seemingly "Ponce es Ponce y lo demás es parking" attitude) says it is in order to "save and protect the integrity of this national symbol" (one that was interestingly created by Puerto Rican exiles in New York in 1895). What color is he trying to change it to? Well, the blue of the triangle - from its official dark blue to its historic light blue (more gasps!). Now, anyone who knows me would think that I am now going crazy - am I not an independentista who knows and believes that the light blue is the original and revolutionary blue? Is this not what I want the flag too look like when the island is finally free and sovereign? Well, yes and yes! And for all those reasons it just boggles my mind why anyone in a position of (somewhat) power would advocate for the changing of a "national symbol" into its more revolutionary roots but also say in the same breath that this is not about the status issue (yeah, ok) but about filling a "legal gap." Boricuas, as special as we are (¿Tú no sabías que Diós es puertorriqueño? ), we cannot have our cake and eat it too. A legislator cannot legislate nationalism while simultaneously shying away from the idea of a sovereign nation. And you know what is the most ironic thing about all of this? That this man is a member of the pro-statehood party! Ave María, what next, the PNP is going to start advocating for a trade agreement with Cuba? Anyway, this idea was shot down by Luis Fracaso... 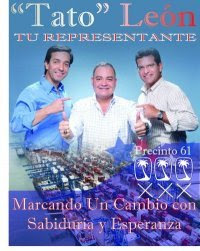 I mean Fortuño, who said in a press conference (in none other than in my town of Juncos!) that this never has been an issue of discussion and will not be in the future. ¡Fuácata! For the past few weeks now there has been quite a few news coverage (especially with a firestorm from the "blogging community") on the possible new Alderman of the 26th Ward, Rev. 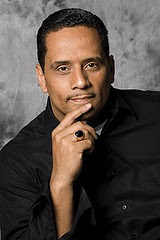 Wilfredo "Choco" De Jesús of New Life Covenant Church. Sadly, much of this coverage has been negative. When I first discovered that longtime Alderman Billy Ocasio was resigning in order to join the Governor's cabinet and that he chose Pastor Choco as his replacement, I thought "this could not be a better choice!" May I ask, which Puerto Rican led institution in Humboldt Park has hundreds of members who are able to promote and organize such a electoral campaign? Next to none! Which community has been able to engage a church and a pastor in important social issues, from community preservation (look at all the real estate New Life has saved from greedy developers!) to immigration reform (by a Puerto Rican church, nonetheless!). In the last few elections in the 26th Ward, which is facing the displacement of its longtime residents (gentrification), we have been bombarded with puppet candidates who wanted to only serve the interests of greedy real estate developers and other anti-Paseo Boricua forces. Of course, some people remained myopic. A few weeks ago, I was one of 20 of the mostly Puerto Rican representatives of different community organizations that work on LGBTQ issues who attended a meeting at La Bruquena restaurant a few weeks ago with Pastor De Jesús. The meeting was allegedly called in order to better understand the Pastor's views on LGBTQ issues. The biggest surprise though was that the vast majority of those who attended did not live in the 26th Ward! Actually many those in attendance represented organizations that did not completely focus on the Humboldt Park community or the 26th Ward. Interestingly enough, it was from those who did not live here that questions about important community issues like gentrification, the development of Paseo Boricua, violence, and education ...etc were absent. The only thing on their minds was this: "You are an evangelical pastor, therefore you hate gay people and you hate us, don't you!?" Up to that point I have never seen a group of people so concerned by just one issue - which is not surprising if you do not live or work in this ward. Nonetheless, it was from those activists who live and work in this community, who organize LGBTQ events (which most of De Jesús' discontents do not attend), and fight homophobia and transphobia on a daily basis in the schools, programs, and institutions of Humboldt Park, that a real dialogue took place. In my experience, Humboldt Park and Paseo Boricua has become such a welcoming space for LGBTQ Boricuas and Latinas/os and that just did not happen because of the "Boystown elite" opened people's eyes. Look at Vida/SIDA as a community institution - where else do you see so many openly lesbian, gay, and transgendered people freely doing outreach to all the members of this community? Where else would there be a transgendered Queen for a major parade other than the Puerto Rican Cultural Center's Desfile del Pueblo/ Puerto Rican People's Parade every June? People have struggled and died to make LGBTQ Boricuas and Latinas/os feel welcomed in their OWN community so we would not have to suffer in the racist, sexist, and elitist so-called "Boystown." To all of De Jesús' discontents, there are a few things to take into consideration. Which evangelical pastor who would meet with a group of LGBTQ leaders? Which evangelical pastor in Chicago would explain herself/himself on hers/his beliefs to such a group? Which evangelical pastor would support the construction of a gay homeless shelter in Humboldt Park? He may believe things that I disagree with, but in the end, there is room for common ground, common understanding and respect, and for struggle and engagement. That is what participatory democracy is about. Another point to consider is that, for those who live and work in the 26th Ward would know that a great and visionary Alderman like Billy Ocasio would never choose a replacement who would not work for and support the diverse experiences of his residents and the major initiatives of this community. Sadly, some have eaten the apple and have abandoned his legacy and vision. Furthermore, without a community there will be no struggle to engage people (leaders or residents) in anything. As the Puerto Rican (and Latina/o) community continues to suffer gentrification then the forum in which to dialogue about important issues such as these becomes less and less available. It just becomes talking heads speaking to an imaginary community. If the Puerto Rican community is desecrated then where will all the LGBTQ Boricuas be? Boystown! Ha! Puerto Ricans were gentrified from Lakeview decades ago. For those who claim to be "Latina/o leaders" take this into consideration: Being a "Latina/o leader" means nothing if you do not have a community to lead. The next Alderman (or Alderwoman) of the 26th Ward will have to understand that in order to truly lead our community into a brighter future. ¡Fuácata! Oh the agony of writing on this again. I know that I need to develop a consistent discipline in writing and reading, especially before I start school again. Summers/vacations have a way of isolating people from their responsibilities and longtime goals. Its like "live for the moment before it gets cold again! (especially for those who live in the Midwestern U.S.) So, what better way than to write on a blog - the ultimate modern-day vehicle of self-indulgence. Anyway, speaking of diddle-dalling, I went to Bronzeville today with my partner and one of my closest friends. Say what you will, but the historical ethnic segregation of Chicago has provided much revenue and fame to the city - all you need is to look at the nickname of this garden metrópolis - the "city of neighborhoods." Of course, red lining and institutional racism is nothing to celebrate, but ethnic segregation has given (and still gives) an opportunity for immigrant groups, especially oppressed immigrant groups (even in the 2nd and 3rd generations) an opportunity to produce spaces of political and cultural resistance to assimilation and to produce an economy on their own terms in the hands of their own compatriotas. Por supuesto, this does not happen everywhere in this city. Bronzeville is an interesting case study, though. As we went to Chicago's House of Chicken and Waffles (which ironically served great tasting black soul food with white and Indian waiters and Mexican cooks - you see a lot when you're waiting 35 minutes to get seated!) we walked through gargantuan empty lots and storefronts, housing complexes isolated by green lawns separating pedestrians with prison-like black gates, and old stone architectural treasures being engulfed by eager yuppies who work downtown. Though, I couldn't help but happily think of the community's golden age when I saw all the black families strolling through its green boulevards, when it was dubbed the "Black Metropolis" (forever memorialized in a 1940s book of the same name). Although, its former infamous alderwoman tried to revitalize the community's black character by promoting a Jazz District, since thousands of its residents have left when red lining became illegal and moved into communities of either greater poverty and marginalization or insular wealth, it still has a long way to go. Hopefully its community residents/leaders and institutions are able to pay justice to its historic hayday while providing a new vision of a black community in the 21st century (that does not have to look the same as the Chicago Housing Authority's ridiculous and racist "mixed-housing" plan that it has already imposed on empty lots and bulldozed housing projects). Awww, a global city-wannabe waiting for the International Olympic Committee's 2016 OK sticker, full of contradictions and fading historical memory. “I am going to have a VERY hard time being at the Ciclo Urbano event if the No Se Vende people are talking about wanting white people to get the hell out in front of my children and waving Puerto Rican flags in our faces, ” wrote a new resident of Humboldt Park in an e-mail to the head of West Town Bikes on April 23. Thus began a comedic fiasco well deserving of the title given to this commentary. But here is some background information first. Humboldt Park (Chicago), in the last few years, is a community where homes, full of memories, are bulldozed and gutted, where families are pushed away by ridiculous increases in rent and harassment by greedy developers and city inspectors, and age-old murals are covered-up. It is in this current reality that West Town Bikes, which is a mostly white-owned and frequented bike shop in Humboldt Park, decided to open-up a shop on Paseo Boricua. And with surprise of some, all this took place with the strong support of the Puerto Rican Cultural Center (PRCC). Why, you must be thinking, would an organization like the PRCC, which has been a leader in promoting and maintaing a Boricua cultural and business corridor along Division Street, facilitate this business' arrival here? Isn't biking like a poor yuppie's form of Starbucks coffee? Well, one of the answers is because Puerto Ricans bike too! Puerto Ricans in Humboldt Park also have huge health disparities, which has pushed-up the rates of diabetes, obesity, and cancer. The PRCC also has programs like CO-OP Humboldt Park and Muévete, which work on the issues of health, including promoting physical activity. And most importantly, it is because being pro-Puerto Rican does not mean being anti-white or anti-new resident. Those Paseo Boricua flags are gates of welcoming and gates of dialogue. West Town bikes respected what the Puerto Rican community has worked so hard to create on Division Street and decided to join the dialogue with its new shop, Ciclo Urbano. They also planned to celebrate this new relationship by organizing a large procession from their old location with the PRCC's Humboldt Park NO SE VENDE! Campaign (HPNSV). However, not all new residents, including the one who sent the e-mail, is as respectful or understanding of all this. The e-mail's author (who I will call “angry neighbor,” since her personal identity is insignificant, but her actions is representative of a greater problem) also complained that HPNSV practiced “reverse racism” and had a “nationalist platform.” The angry neighbor made it a point to proudly claim that she was white, despite the fact she is “half hispanic” (her words), as a way to connect with the head of West Town Bikes. To sum it up, the e-mail's tone was along the lines of “we need to do something about these Puerto Ricans.” West Town Bikes did not buy it and we all enjoyed a procession on May 1 that included over 200 people. Sadly, divisive tactics like those of angry neighbor is something that will only further destroy all the work that people have put into developing Paseo Boricua. There is an ever present sense of “yuppie isolationism,” where many angry new residents, longing for another Bucktown, seek to replace Paseo Boricua with their own visions of community instead of working with the community. In the “city of neighborhoods” - a slogan that emerges from a horrendous history of racism and urban segregation – one can explore the world in only a few miles and a few minutes. In this global city one can find Pilsen, where México lurks in old Czech architecture and Bronzeville, the historic center of the “Black Metropolis.” One could also hear the loud sounds of Café Colao coffee brewing behind its counter, snapping its customers back home. The communities that I mentioned suffers from stains of ghettoization, places where people of color were forced to occupy, but are beginning to experience cultural and economic rebirth - development from the vision of its longtime residents. Sadly, Chicago, like most U.S. cities, is on a path of Disneyland cookie-cutter dreams– a metropolis of Lincoln and Wicker Parks for miles and miles. Like Pilsen and Bronzeville, Paseo Boricua and all of Humboldt Park, is in the path of the slow-moving bulldozer called gentrification. Our destruction will only please people like the angry neighbor and that is why we cannot let it happen anymore.